If you want to start out a season, the opening day of the SKUSA SpringNationals is the way to do it. Thrilling excitement throughout the day around the Jim Russell International Karting Center circuit crowned the inaugural nine winners in the series’ debut in Sonoma, California. The weather was near perfect despite a strong wind coming over the mountains surrounding the Infineon Raceway. Phil Giebler and Fritz Leesmann were the stars of the opening day as each drove to victory on day one in two different situations. The TaG Senior division took the shotgun spot on the schedule for Saturday’s action as the headline division for the day. With the open pit lane for the 12-minute qualifying session, business was expected to be busy during the run. Early on, NorCal driver Gregory Liefooghe (CRG) was the provisional pole sitter with young star Adrian Starrantino (CRG) high on the order. Drivers began ducking down onto pit lane to make some changes in effort to improve their lap times. Liefooghe came in and sat, waiting to see if anyone would better his lap time of 49.969. With no one able to dip below the 50-second mark, Liefooghe earned the top qualifying spot with Starrantino set to start outside row one. Phil Giebler (FA Kart) was third quickest in the session with veteran Larry Fraser (GP) edging out Tory Diede (Intrepid) for fourth. Liefooghe held strong in the opening heat race as he was ale to fend off a charger Giebler. The former ICA national champion posted the fastest lap of the eight-lap heat race but came up 0.096-seconds short of the win behind the consistent Liefooghe. Starrantino was in the battle until lap five when he experienced brake failure on his CRG machine, putting him on the sidelines. Fraser ran alone in third as Bobby Kelly (Maddox) advanced up fourth with Diede able to hold off Jess Peterson (Intrepid) for fifth. The second heat race drama began before the green flag waved as Giebler was unable to get his Vortex engine started, with what was later determined to be a bad stator. This put him at the tail of the grid for the main event while the rest of the field took the green flag for the second eight-lap battle. Liefooghe continue his run at the front after moving to row following a few false starts to take the green flag. After the first few circuits, Liefooghe returned to the point and led Fraser and Kelley to the checkered flag. Diede moved up one spot to fourth with Travis Lowe (FA Kart) jumping into the top-five. A new era for Superkarts! USA began on Friday with a rebirth of national level racing for the organization. The new SKUSA Pro Tour is making its debut this weekend with the running of the inaugural SpringNationals, held at the Jim Russell International Karting Center at Infineon Raceway. 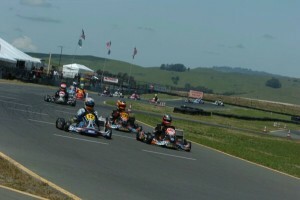 The Sonoma, California circuit has hosted a number of major events in its history, including a number of national events from in the previous era of the sanctioning body. The weather was perfect for on-track activities with clear skies and warm temperatures. Drivers grew accustomed to the 3/4-mile course, which is being run in the reverse national configuration, a layout that many have never seen. Judging by the practice laps run on Friday, a number of key corners around the course will provide optimal passing opportunities. Following the on-track action of the day, Superkarts! USA hosted a tri-tip BBQ dinner with beverages being provided of J3 Competition. Media leaders eKartingNews.com were also on-hand, streaming a live audio wrap-up show that also played via PA to the racers as they enjoyed their meal. On the line for the headline categories will be weekend purse of $1,750 in cash for both S1 (Pro Stock Moto) and TaG Senior. Drivers will be gunning for victories, but also for the season championship that features a point fund of $8,000 with $5,000 going to the champ. For all of the classes competing on the SKUSA Pro Tour, the top-five in the standings heading into the finale - the SKUSA SuperNationals XIV in Las Vegas will have guaranteed starting positions for the main events, which is huge considering the fact that only 40 drivers can start the finals. The champions who will be crowned following the November event will earn the National Number One Plate as well as special sponsorship for the 2011 season. Make sure to tune into www.ekartingnews.com/live for live audio and scoring coverage of the Pro Tour SpringNationals. You will also find the official discussion thread on the EKN forums there as well where you can find up to the minute race results. EKN will start broadcasting audio near the start of Practice 5 at aproximately 1:30pm PST. Important Pro Tour Deadlines Approaching! Host Hotel -- Special Pricing Cutoff is THIS Friday, April 9, at midnight! The Embassy Suites in San Rafael, CA is our host hotel for the first Pro Tour race weekend at Infineon April 16-18, and they have worked out some GREAT rates starting Wednesday night, 4/14! The current special pricing -- which applies to the next 25 rooms booked -- is just $109 for single or double occupancy! Click here for more details and to reserve your rooms today! Don't stay anywhere else -- this is where Thursday check-in registration -- and all of the parties -- will be! Pre-Entry Cutoff to Race is THIS Sunday, April 11th at midnight! Don't miss out on the first race weekend of the new SKUSA Pro Tour! Pre-registration is open now online -- and must be done with a credit or debit card. The cutoff to pre-register is this Sunday, April 11th, at midnight. Anyone wanting to register after that will have to sign-up on Thursday 2-7:30pm at the Embassy Suites or Friday morning at the track, with $150 added as the at-event registration fee! Save some money! Pre-register today! Due to the durability of the MG-HZ tires and in the interest of additional savings to our newest racers, SKUSA will only require ProTour competitors in the TaG Cadet class to purchase 1 set of race tires for each 2-race weekend. As entries received to date have included 2 sets of tires, SKUSA is willing to pre-ship one set for practice at no charge -- up until the week of the event. Call the SKUSA head office at 951-491-0808 with additional questions or to order your practice tires shipped.